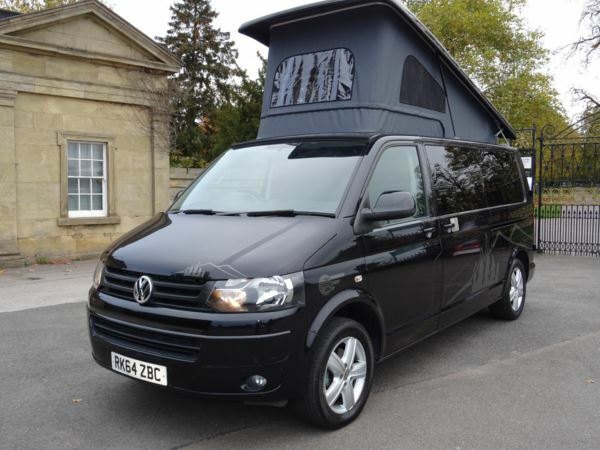 2014 reg, 33475 miles, Manual 1968cc Diesel, Van, Black. Kitchen Cupboard / WardrobeColours available from stock is DRIFTWOOD & SILVER TRIM with matching corners. BLACK Sparkle & BLACK TRIM Worktop & Table, But again you can bespoke this if you wish!Consists of a curved worktop with well thought out storage underneath. The wardrobe has a rear tambour door (x 2 in LWB to guarantee no obstruction to the rock & roll bed. It also includes storage pockets above the worktop and at the rear to put your regularly used items in for easy access. Cooker / Fridge / SinkDometic gas double burner hob, and sink with tap and glass worktops.Dometic 50 Ltr 12 volt Compressor fridge, giving plenty of use between battery charging (via the fitted on board split charge system) - not the old fashioned 2 and 3 way gas, 12 & 240 volt fridges as are often fitted in &apos;budget&apos; conversions giving only a couple of hours use on your leisure battery.Bed and Seating area The CCCAMPERS M1 crash tested &apos;Bliss&apos; bed/seat is fully upholstered in black.Fixed travelling table. The table is removable with a folding leg so easily tucked away.The Water, Gas, 12 & 240 VoltRCD Trip switched protected 240-volt electric hookup system with a single socket.12 volt led battery level tester with easy access fuses. LED lighting and micro switched flow controlled tap. Which is all connected to a 70 amp split charging system with leisure battery running the whole of your conversion.30-litre water system.The Bed incorporates a metal enclosed Campingaz 2.75 kg Butane locker this was tested to M1 Standards for total peace of mind safety.Carpet line, floor, windows, curtains and thermo mats for cabThis includes:- Two fitted standard mid windows Passengers side rear window and driver side access panel. Insulate and carpet line with extra detail and shape in the rear of your van. Commercial grade flooring. Thermos Blinds for the front cab and rear curtains for all windows. The carpet colour is grey and rear floor is covered in commercial quality black vinyl. But you can bespoke this if you wish by adding our custom carpet sets.Pop Top / Elevating RoofThis can be full colour coded to match your camper but comes as standard in GRP Black. The roof is manufactured to the highest standard and incorporates a front spoiler. Part exchange always well..For more information or to arrange viewing call Howard -: 07930 185860.